It is the simple things, like being able to wash the blood off after you fight a zombie horde that make life worth living. Which means you will be happy you keep this Camping Shower close at hand. If you’ve ever been to Asia, those spray handles should look familiar, almost every rest room will have a water sprayer on the wall – because TP is for uncivilized nations. Guess what makes a great bathroom tool when all the TP is used up and people are too busy killing zombies to worry about scavenging something as frivolous as rolled up TP. Spray it (your tookus), dry it, and your good to go. Need to wash your feet before getting into your camper? Or just want to smell nice before you climb into your sleeping bag with your SO? Is Serenity a zombie movie? It sure is. The Federation has unleashed the Reavers on the universe after experimenting with weaponizing modified humans. What could go wrong right? Serenity, and the movie not a classical zombie movie, so I am going to deduct a point for that. Which leaves Serenity with an almost perfect 99/100. If you haven’t had the pleasure of watching this classic, make it a priority, you won’t regret it. Security is about being prepared, and planning ahead, which is exactly what you will be doing when you install these Defender Security Fixed Window Guards. People who want to break in and steal from you will have a second thought when they see your well defended windows, but more importantly, the zombies won’t be able to climb through your windows and eat you. Two things made me look at this California Air Tools Quiet Air Compressor. The first was its size. It is big enough for the jobs I need it to do, but small enough to put on a shelf in my garage and take wherever I need it to go. The second is that it is quiet. At 56 decibels it is significantly more quiet than a lot of the competition. All things that make this Air Compressor the perfect addition to my garage. When it comes to surviving the apocalypse, having the right tools, and making sure they are as portable and as quiet as possible, will give you a better chance of survival. The Return of the Living Dead is a cult classic for a reason. It’s fun, over the top, and has the perfect mix of not taking itself too seriously. It’s Freddie’s first day on the job a a medical supply warehouse. Unfortunately for him, the bodies stored in the drums in the basement are about to cause him and his friends a lot of trouble. In true zombie fashion, when the dead come back to life they only care about one thing – eating brains. It’s a classic, and holds up well after three decades of elapsed time, earns a solid 85/100. The movie is almost worth watching just for the Linnea Quigley scenes. The first time I saw this movie i think I was thirteen or fourteen, and the images of her dancing (sans clothing) have been etched in my lizard brain since then. In a dark world, light can be seen from a long ways off. Don’t be a target for other survivors, or attract any other unneeded attention to your location, make sure you have Blackout Curtains on every opening, including enough to put over your entries. Those solar panels powering your lights and the food that you have stockpiled will become highly sought after gear in the post apocalyptic world, don’t become a target by marauders by telling them where the good stuff is with a beacon shining through your window. A well rounded security plan doesn’t rely on a single component or feature. You want a multi layered, comprehensive approach to every aspect of your security plan. This HAVEN Heavy Duty Lock, Floor Mounted Lock is a critical component of your physical security plan. A regular front door isn’t going to stand up to more than single kick, if it even holds for that. 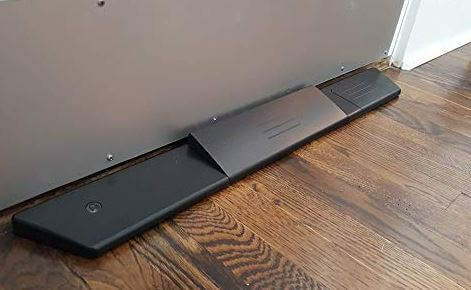 To make sure that first line of defense holds, you want to make that door as secure as possible, which is exactly where this HAVEN Heavy Duty Lock comes into play. When paired with Door Armor (Day 72) and a high quality security door, you can have confidence your front door is going to be a formidable obstacle for anyone, or anything, to get through. ULTRA-STRONG LOCKING WEDGE: Reinforces with the strength of your home’s foundation. Industrial-strength polycarbonate bends when someone tries to force open the door — and flexes to use attackers’ energy against them. You get six of these 5 Gallon Samson Stackers which means you can store up to thirty gallons of water, while also keeping it in a package that is portable. If you do have to move home base, you can load these up and take them with you, which is a nice feature when the apocalypse is changing your living space every day. PORTABLE: Drums are great but you can’t take them with you. Compact storage in handy 5-gallon units. Garage to pickup to kitchen counter to campsite, your emergency water is now a portable resource. STACKABLE: Geometry on the top of each container aligns with contours on the bottom for convenient stacking (ref detailed description below). Each container is approximately 11.25″ x 10″ x 14.25″ tall with the top approximately 1/4″ engaging with the bottom of a stacked container. SAFE: High Density PolyEthylene (HDPE) is a preferred polymer. HDPE is not a candidate for BPA, a reassurance for those of use requiring BPA free containers. The industry term is “BPA non-intent”. The resin is USA sourced and FDA compliant. …that means ‘food grade’ to the rest of us. ACCESSORIES: Your Samson Stackers will come with a factory installed dust plug that can be discarded when ready to use (see details below). Each container also includes a gasketed cap with Rieke (TM) style exterior geometry. The reusable caps also have a tamper evidencing lock ring that will break away after first use. The caps are center threaded 3/4″ NPT with a membrane that can be cut away for use with a spigot. Each kit includes one spigot. Each kit also includes one wrench to fit the caps. PROVEN: These are industrial grade containers used by manufacturers and packagers to ship a variety of materials and food products. The reputable Samson Stackers are Made in the USA by API/Kirk. Shipping is included in the Price. Night of the Comet is the movie that made me fall in love with the zombie genre. It has a great story revolving around two gorgeous sisters who are luckily inside when the Night of the Comet turns everyone who was exposed into the undead. The movie is over twenty years old, and yet it has held up really well, only falling from a 100/100 back in the 80’s to an 85/100 now. If you haven’t watched Night of the Comet, you have to put it on your short list now.